Officials have been unable to verify recent reports of mountain lion sightings in New Castle, however, residents should be aware and continue to report any lion sightings in residential areas. A post on the popular Visit New Castle Facebook page stated that a mountain lion was heard in the Castle Valley Ranch neighborhood Oct. 18. “Please keep children and pets inside at dusk and after dark,” the post read. One person commented that she saw a lion near her property about a month ago. Bruce Leland, New Castle mayor pro tem and an administrator for the Visit New Castle page, said there have been four posts regarding mountain lions recently. “Mountain lions are not at all unusual in the (Bureau of Land Management land) north of town,” Leland noted. A brief message titled “mountain lion sighted in New Castle” was posted on the town’s website Wednesday. However, New Castle Police Chief Tony Pagni said the department has only received one report recently and there was no actual lion sighting. Rather, the family observed some deer running and suspected a predator could be chasing the deer. Pagni, a lifelong hunter, said he investigated the report and found no signs of a lion. 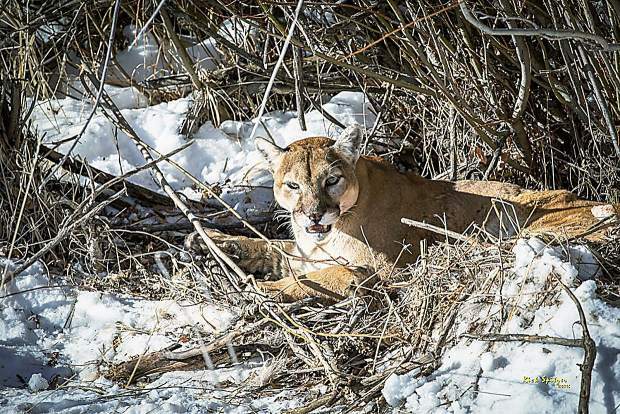 “Certainly I can’t confirm there was a mountain lion,” the chief said while echoing Leland’s comments about mountain lions inhabiting the area. Porras said it is possible that the sightings were reported to area wildlife officers, but he was unaware of them. Mountain lions are predators and as their prey move from higher summer ranges to lower elevation winter ranges the lions follow. As more development occurs in areas that have long served as winter ranges for mule deer and other animals, the more likely encounters become. A sign posted at Colorado Mountain College’s Spring Valley Campus warned about a recent single lion sighting. However, mountain lion attacks on humans are extremely rare, Porras said. CPW notes on its website that there have been fewer than 12 fatalities in North America in more than 100 years. The most important thing people can do is educate themselves about lions and call the proper authorities immediately if a lion is spotted in a residential community. People should call the CPW office in Grand Junction at 970-255-6100 to report a sighting during business hours Monday through Friday. Outside of business hours, people can call Colorado State Patrol to connect with a wildlife officer. In northwest Colorado, CSP dispatch operates out of communication centers in Craig, 970-824-5601, and Montrose, 970-249-4392. Visit the CPW website for more information on what to do during lion encounters, as well as information on living in areas with lions.